Republished from TelsurTV (18/4/15). See also: Global Research | "US Human Rights Abusers Not Welcome in Venezuela." President Maduro Calls for "Global Rebellion Against US Imperialism" (2/2/15) and other related articles. Julian Assange has joined a range of other prominent Australians in condemning the sanctions on Venezuela. 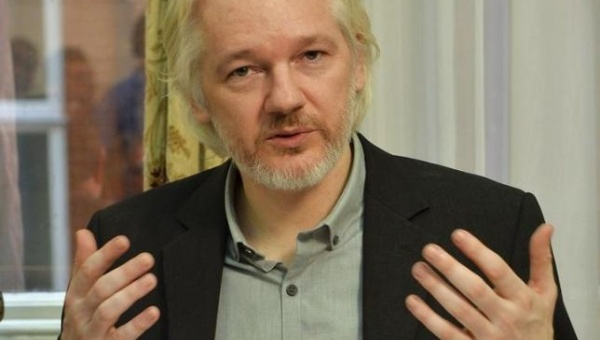 WikiLeaks founder Julian Assange has added his name to a growing list of Australian journalists, academics, politicians, trade unionists and solidarity activists calling on U.S. president Barack Obama to revoke his executive order against Venezuela. On March 9, Obama issued the order which imposed sanctions on a number of Venezuelan state officials and deemed Venezuela to be an "unusual and extraordinary threat to the national security and foreign policy of the United States." In response, the Venezuela Solidarity Campaign (Melbourne), with the support of the Australia Venezuela Solidarity Network, initiated an open letter to Obama. The letter has over 70 signatories, including Assange, renowned journalists John Pilger and Antony Loewenstein, Greens senator Lee Rhiannon, two socialist local councillors, officials from four different trade unions, academics from ten universities, and representatives from a range of political parties and solidarity organisations. The letter urges the U.S. president to revoke the executive order and "stop interfering in Venezuela's domestic affairs and cease making reckless public statements regarding Venezuela's democratic processes." It also encourages Obama to "demonstrate to Latin America that the U.S. is capable of establishing relations based on the principles of peace and with respect for their sovereignty." Obama's recent actions have seen relations continue to sour between the U.S. and the rest of the Americas. At the recent Summit of the Americas, held in Panama April 10-11, numerous regional heads of states expressed their support for Venezuela and called on Obama to revoke the executive order. Even though most will scoff at the idea that Venezuela is a real military threat to the United States (given the size and nuclear capability and the fact that Venezuela recently reduced its military by an unheard of 34%), the spread of an ideology that challenges the United States' right to exploit and impoverish its southern neighbors could be sufficient reason to consider Venezuela a "threat" to United States' ideology of imperialism; thus causing the US to resort to its age old practice of "regime change." For the past 150 years, the United States has treated Latin American as its own personal backyard to exploit. Most of the exploitation has been accomplished through economic dominance and the support of right-wing dictatorships. The United States, which saw many of its businesses and interests overruled by the Bolivarian Revolution, previously backed a coup against Chavez in 2002. Attempts to weaken Maduro's legitimacy, Chavez's successor, were stepped up when the results were announced. Even US allies in the region failed to echo its concerns about human rights in Venezuela and instead unanimously condemned US intervention. Mr Obama has now backtracked by saying that Venezuela isn’t really a threat, the executive order has not been rescinded. It can't be the military of Venezuela which is no match to the US military at all. The threat is geostrategical as China is playing the mayor role in this game. China has already started to build a second "Panama Canal" through Nicaraguan territory, the "Nicaragua Canal". China has been generously co-signing financial transactions with the Venezuelan government including the borrowing of billions of dollars in exchange for future trade advantages. In contrast to China, funding from the United States often involves conditions in which less developed countries are asked to follow the United State’s neoliberal model for their development. Washington perceives Beijing’s move into Latin America as a threat to its authority.